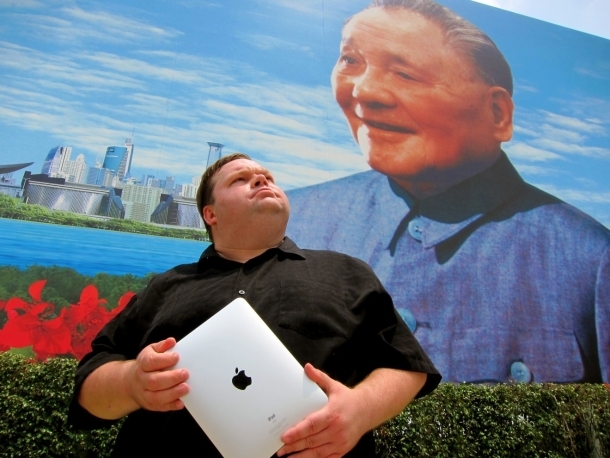 (AP) NEW YORK - Mike Daisey, the off-Broadway performer who admitted that he made up parts of his one-man show about Apple products being made in Chinese sweatshops, has cut questionable sections from the monologue and added a prologue explaining the controversy. Oskar Eustis, artistic director of The Public Theater, where the monologue is being performed, said Saturday that Daisey has "eliminated anything he doesn't feel he can stand behind" from the show and added a section at the beginning in which he addresses the questions raised by critics. Eustis called the prologue "the best possible frame we could give the audience for the controversy" and said Daisey agreed to make the changes himself, which are "his and his alone." "Mike is a great storyteller, not a journalist. I wish he had been clearer about that distinction in the making of this piece," Eustis said after seeing Saturday's matinee performance. "If we had understood the rules Mike was using to make the show, we would have framed it differently from the outset." Daisey portrayed his work as fact during a media blitz to promote his critically acclaimed show, and he misled dozens of news and entertainment outlets, including the popular public radio show "This American Life," The Associated Press, The New York Times, MSNBC and HBO's "Real Time with Bill Maher." But in an interview with "This American Life" host Ira Glass broadcast Friday, Daisey acknowledged that some of the claims in his show, "The Agony and the Ecstasy of Steve Jobs," weren't true. The show retracted its Jan. 6 episode because Glass said he couldn't vouch for the truth of its claims. Daisey, who admitted Friday on his website that the work is a mix of fact and fiction, did not respond to questions sent to his personal email account, and his publicist did not respond to a request for comment Saturday. The controversy is unlikely to lessen the media scrutiny of the Chinese factories that make Apple products, since news outlets including the Times have reported about the dangerous working conditions in them, including explosions inside iPad plants where four people were killed and 77 were injured. But some of Daisey's older monologues might get a second look. "If he had only chosen to actually utilize what theatre allows you to do  which is to transform fact into something that retains an emotional truth," said Howard Sherman, a former executive director of the American Theatre Wing and an arts administrator and producer. He didn't see Daisey's show but said he thought it might "call into question people who do this in the future." Daisey is just the latest artist to apparently get tripped up by the truth  joining a list that includes James Frey, who admitted that he lied in his memoir "A Million Little Pieces," and Greg Mortenson, who is accused of fabricating key parts of his best-selling book "Three Cups of Tea." The controversy raised once again the question of the artist's role in society and what his or her responsibility is to the truth. And has Daisey ultimately hurt or harmed the very people he was trying to help? Terry Teachout, chief theater critic for The Wall Street Journal, called Daisy a talented artist but said the episode was "unforgivable," and Peter Marks, the critic for The Washington Post, tweeted that Daisey's "zeal seems to have gotten the better of his judgment." Chris Jones at the Chicago Tribune suspected Daisey "was seduced by the glare of attention." The controversy put The Public, where the work ends its second run on Sunday, in a difficult spot  protective of artists and their right to free expression but also sensitive to audience concerns. "We do not and cannot fact check our artists; we're a theater, not a news organization. The vast majority of what occurs on our stages is fiction. If we didn't believe fiction could reveal truth, we would have to give up our profession. With that said, it obviously matters a great deal to me that our audience understands what they are seeing," Eustis said. Daisey, who performs his monologues seated at a desk and using notes, has previously tackled everything from dysfunctional dot-coms to the international financial crisis. A movie has been made of his monologue "If You See Something Say Something," and in a weird twist, he did a 2006 show called "Truth" about how art and fact mix. In it, Daisey admitted he once fabricated a story because it "connected" with the audience. Daisey told Glass he felt conflicted about presenting things that he knew weren't true. But he said he felt "trapped" and was afraid people would no longer care about the abuses at the factories if he didn't present things in a dramatic way. In an interview with the AP last year when his show was first in New York, Daisey's passion for humane treatment of Chinese workers was evident. "Artists are people who are called to action," he said. "If they're not active then they're probably asleep." An Apple spokeswoman declined again Saturday to comment on the revelations about the monologue. The company has been rebutting Daisey's allegations for months, to little effect. Before he scrubbed the monologue, Daisey described traveling to the Chinese industrial zone of Shenzhen and interviewing hundreds of workers from Foxconn Technology Group, the world's largest electronics contract manufacturer. Daisey said he stood outside the gate with a translator and met workers as young as 12 and some whose joints were damaged because they performed the same action thousands of times a shift. "I talk to people whose joints in their hands have disintegrated from working on the line, doing the same motion hundreds and hundreds of thousands of times. It's like carpal tunnel on a scale we can scarcely imagine," he says, according to a transcript of the show. Later in the monologue, he said he met workers poisoned by the chemical hexane, used to clear iPhone screens. But "This American Life" reported Daisey's Chinese interpreter disputed many of the artist's claims when contacted by Rob Schmitz, a China correspondent for the public radio show "Marketplace." Among them, the translator said guards outside the factory weren't armed, Daisey never met workers from a secret union and he never visited factory dorm rooms. Daisey told Glass he didn't meet any poisoned workers and guessed at the ages of some he met. He also said some details he used were things he read about happening elsewhere. "I'm not going to say that I didn't take a few shortcuts in my passion to be heard," he told Glass. "But I stand behind the work. My mistake, the mistake that I truly regret is that I had it on your show as journalism, and it's not journalism. It's theater." In the edited monologue, Eustis said Daisey acknowledges "that his translator, Cathy, does not remember things which he does remember." Apple's popularity among consumers and investors alike has only grown while Daisey has been railing against the company. Since Daisey's one-man show hit the stage in the summer of 2010, Apple has sold more than 74 million iPhones, more than 35 million iPads and more than 29 million iPods. Propelled by the surging sales of Apple's devices, the company stock price has climbed nearly 70 percent to create an additional $220 billion in shareholder wealth. Apple now reigns as the world's richest company, with nearly $100 billion in cash and a market value of $546 billion. Daisey's embellishments threaten to set back the efforts to improve the working conditions in China and other countries where many trendy gadgets are made, said veteran technology analyst Rob Enderle. He fears Daisey's tainted credibility will embolden more U.S. companies to turn a blind eye to how the assembly-line workers are being treated in the overseas factories run by their contractors. "It will make it more difficult to correct these labor injustices in China," Enderle said. "Daisey tried to make this out to be an Apple problem, but it really wasn't. It's a China problem." Eustis hopes audiences will not let the controversy distract them for Daisey's main points. "The subject matter of this piece  the way we allow working people who make our objects elsewhere in the world to be treated  is incredibly important, and it is vital that we not be distracted from that subject by this controversy." Daisey  a performer in the vein of Spalding Gray and John Leguizamo  has performed the monologue for more than 50,000 people from Seattle to Washington, D.C. He was expected to take the show on tour after its run at The Public Theater.